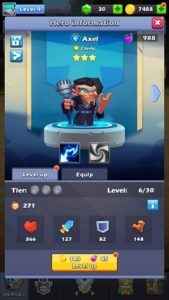 As usual, TapTap Heroes game starts with a tutorial in which you learn about the basic mechanics of the game; how to play TapTap heroes, about upgrades, equipment, breakdown, souls, and much more. After the tutorial, the player has to manually take care of all kinds of activities. Now, let’s start the TapTap Heroes guide and learn everything about the game. Most of the features such as quests, arena, miracle tree, and more are locked at the beginning of the game. You need to level-up to unlock these locked features. Experience points(EXP) are required to level-up. You earn these experience points by defeating the waves of enemies or in the boss battles or through other game modes. As stated above, your heroes automatically fight in the game. Once you defeat a set of waves, you have to defeat the boss in the boss battle to move to the next stage. As you clear more stages, you earn more coins, EXP, purple souls per second. Don’t forget to open the chest after the heroes defeat a wave. In this part, we will talk about the heroes; how to breakdown heroes, unlock new heroes, and much more. How to unlock new heroes? Grand Summon – requires the golden key – get 3-star, 4-star, 5-star hero. If you have lots of heroes and you don’t want them. It would be better to use breakdown feature. Using it, you can obtain golden souls, purple souls or other souls. TatpTap Heroes Guide -> Go to the castle tab -> altar -> choose a hero you want to break down and then hit the breakdown button. You will get souls by breaking down a hero. Use these souls to upgrade the heroes. Expeditions – It is an endless battle mode where the heroes’ HP does not recover and you have to face different types of enemies. Den of Secrets – To earn powerful equipment and a huge amount of golden souls, play this mode. Defeat those powerful guards and claim the reward. Miracle Tree – Miracle tree gets unlocked at level 25. To use miracle tree feature, you need miracle eyes, can be obtained from tavern quests or event packs. You can summon 4-star heroes, 5-star heroes, 4-star omnishards, 5-star omnishards. Tavern – You send the heroes on quests for rewards. The quest changes every 24 hours. Complete these quests to earn more rewards. Now, let’s start the TapTap Heroes cheats tips and strategy to progress fast, defeat powerful heroes, get 5-star heroes. A goblin arrives twice a day and by defeating the goblin, you could earn decent rewards; the huge amount of coins, golden souls, and much more. You just tap on the goblin to use the minion attack. Since low-quality heroes are not so powerful, you can not defeat the powerful guards or bosses. So, the 5-star heroes required to slay down the powerful guards. How to get the 5-star heroes in this game? Register – Go to the events tab, just above the gift icon. Head to the register section. Register with an email address. Claim the 5-star hero when you reach the level 45. Use golden summon – you will get the golden key after every 24 hours. Use it daily. Go to menu – mail – I got one golden key from here. TapTap Heroes cheats -> create the 5-star and 6-star heroes. You can use creation bag feature to create the 5-star heroes and 6-star heroes. For this, you need to fuse the weaker heroes. Go to the castle -> creation of bag -> if you have all the heroes required for fusion -> hit the fuse button. As you know, 10 hearts are required to summon a hero using friendship summon feature. You can earn hearts by adding friends to your friend list. If they accept the request, you will earn the heart. You can not add an unlimited number of friends, so, delete them from your list once you received the reward. It is the basic task you have to take care of. Keep upgrading the hero’s stats; HP, attack power, defense by leveling up. To level-up, you need purple souls, can be obtained by defeating the enemies in battle. Go to the hero tab – select the hero – level up. To unlock the new skills of a hero, you need to upgrade the tier level. Reach the certain level of a hero; 30, 40, and so on to promote it and for upgrading the tier level. Equipment increases the attack power and defense power of a hero. Go to the hero info -> head to the equip tab -> tap on the auto button to equip the strongest equipment. Go to the castle tab -> blacksmith -> tap on an item you want to forge -> hit the forge button. Note; only equipment in the bag can be used for forging(excluding equipped by the heroes). Go to the store -> watch the video ad and claim free gems. (Tap on the + icon next to gems to go to the store).